[Giveaway] Announcement of the Winner for the LiSa CD Giveaway! We have read through the comments and narrowed down the winner! Time flies doesn’t it? Soon we are all going to welcome the year 2014 with open arms. 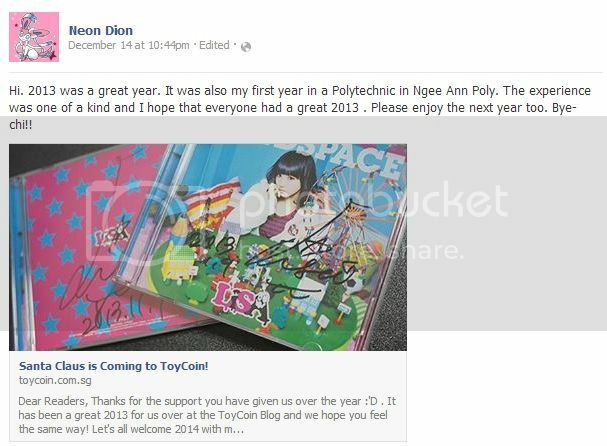 Anyway, congrats Dion, we will be contacting you shortly via email! Thanks guys for participating, we hope the new year is a wonderful year for all. 2014 was a roller coaster ride for us, especially towards the end of the year. We are embracing a lot of projects in 2014, and I am looking forward to announcing them. We hope to be able to bring more interesting concepts to you people, and we appreciate how supportive you guys have towards us because it gives us hope hope for the industry in Singapore. There’s a lot of people who are working very hard in this industry in Singapore, you may not know it, and the support you guys gave us simply keep us going. With that said, we welcome any feedback because we really do hope to improve ourselves. Onward to more lovely figures!